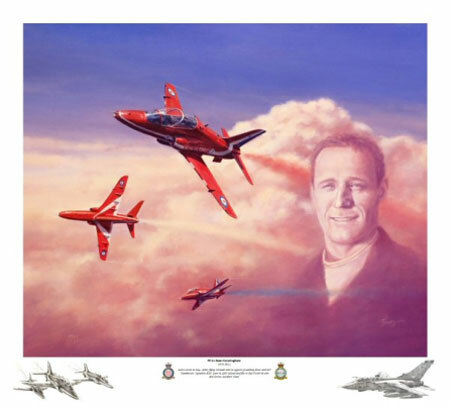 Artist and competition sponsor Terry Jones released two fundraising prints following the tragic deaths of two Red Arrows pilots John Egging and Sean Cunningham. The proceeds from the sale of these prints reaised money for the John Egging Trust and The Royal Air Force Benevolent Fund – both very worthy causes. Tastefully painted tributes to eachof these skilled aviators and the Red Arrows Aerobatic Team whose dedication to duty is an inspiration for us all. This offer comes complete with the option of eight different borders containing hand drawn images by the artist. You can be assured that regardless of which borders are chosen, these double remarque prints will only have a run of 150 in total for each pilot, making this limited edition even more of a rarity. This opportunity is a must for any Red Arrows fan or anyone who wishes to add these unique pieces of artwork to their private collection. Each print is individually numbered, signed by the artist, and is issued with a Certificate of Authenticity. As stated previously, proceeds made from all prints sold will go to the Jon Egging Trust and The Royal Air Force Benevolent Fund. Please note that whilst all proceeds from the sale of these prints will go to the respective charities, remarque’s are an addition to the prints and do not form part of the charitable donation. 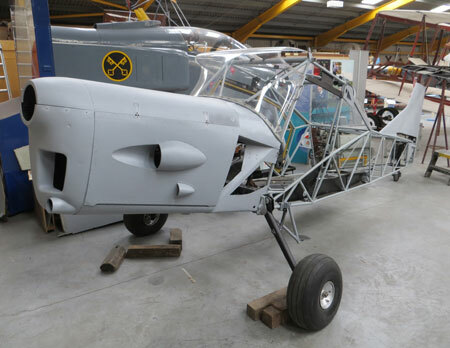 Work on the on-going re-build of General Aircraft Monospar VH-UTH at Newark Air Museum continues to extend the knowledge of the volunteers undertaking the work on this rare airframe. Still working without any detailed plans for the ST-12 Monospar much of the most recent work has involved detailed structural items in and around the cockpit / fuselage. Wherever possible the restoration team has been incorporating original items back into the airframe. In the cockpit the instrument panel has been reinstalled, along with most of the original instruments. Whilst the project was at Innsworth, some of the instruments were ‘quarantined’ and a decision is currently pending to decide whether or not these are refitted. If suitable replacements can be found these may be replaced, if not the originals will be incorporated and access to the cockpit area monitored. Just aft of the cockpit the fuselage luggage hatch is being carefully rebuilt and this work is incorporating all of the original framework and hinges, which are contoured to the fuselage profile. However it seems likely that a new door will need to be fabricated as the original was damaged beyond repair. A setback to the project has recently occurred with the enforced retirement of one of the team members, due to family health issues. His dedication and engineering skills will be missed, but his enforced departure will no doubt spur on the team members to continue with this project during the coming months. Creation of £75,000 Wargaming.net Interpretation Zone for Dornier 17 at RAF Museum’s West Midlands site. In June the world witnessed the successful project to raise the only known German Dornier Do-17 bomber, from the waters of the Goodwin Sands, three miles off the coast of England. From October 16th the general public will be able to experience a dynamic new exhibition at its Cosford site which will explore the background of this legendary aircraft and its recovery. The creation of the ‘Wargaming.net Interpretation Zone’ has been funded by Wargaming, an award winning global game publisher and developer. The grant of £75,000 has allowed the Museum to work with redLoop: the Middlesex University Design and Innovation Centre, to develop new approaches to the display and interpretation of the Dornier as it is conserved. A number of interventions will tell the story of the Dornier, its recovery and conservation – in both the Museum’s physical and digital spaces. At both sites the public will also be able to see an augmented reality Dornier flying above the Museum, showing the aircraft as it would have been seen in 1940. Visitors will be able to view this through their smart phones via a newly developed app. Additionally exhibits at both sites will display multi-media content – from footage of the Dornier in action in 1940, to film of the recovery operation and the chance to witness the Dornier in action in the Wargaming release World of Warplanes. The Museum has also tied in with organisations across the globe including the Canada Aviation and Space Museum, The Air Force Museum of New Zealand Museum plus the Pima Air & Space Museum/Arizona Aerospace Foundation to celebrate the launch of the exhibition. Visitors to those Museums will also be able to see the augmented reality Dorniers through their smart phones, hovering in situ. The exhibition will allow the Museum to develop new education offers focussing on the STEM subjects as well as creating a space where community groups and adult education partners can take part in the Dornier experience. A new dedicated website will also be launched which will the story of the Dornier and its recovery and conservation. The website will showcase the social history behind the Dornier, the forensic science behind its discovery and recovery, archive footage from the Museum as well as user generated content. The website will develop with the Dornier project and function as an innovative hyper textual documentary for the project. redLoop is a research-led, innovation and design collaboration centre based within the School of Science and Technology at Middlesex University London. Dunsfold Park Ltd and Brooklands Museum were delighted to welcome the last Vickers VC10 to its new permanent home today (Tuesday 24 September 2013) at the famous Surrey airfield. The VC10, which carries the RAF serial number ZA150, was the very last VC10 of 54 built at Brooklands in the 1960s and was one of the last two flying with the RAF from Brize Norton in Oxfordshire and retired this week after completing a total of 43,400 flying hours. The aircraft landed on the airfield at 13:43, flown by Sqn Ldr Tim Kemp with his aircrew, co-pilot Fl Lt Shane Stiger, engineer Fl Flt Kevin Booth and Navigator Flt Lt Bruce Thompson. Over 160 visiting public joined members of the aviation teams from Dunsfold Park and Brooklands Museum to witness the final flight. Also in attendance were Lord Trefgarne, Chairman of Brooklands Museum Trust, Trustee Penelope Keith and Angela Newton, daughter of Sir George Edwards, the Managing Director of BAC while the VC10 was developed and built. Much to the delight of the watching crowds, the VC10 did an impressive full throttle flypast down the runway ensuring everyone felt the power and enjoyed the noise of its engines one last time. Banking around the aerodrome she faultlessly landed before being towed to her final resting place. Longer-term arrangements for public access to the VC10 at Dunsfold Park and Wings & Wheels will be confirmed in due course. Dunsfold Park and Brooklands Museum are pleased to announce that the last Vickers VC10 will arrive tomorrow (Tuesday 24th September) at its new permanent home, the famous Surrey airfield. The VC10, which carries the RAF serial number ZA150, was the very last VC10 of 54 built at Brooklands in the 1960s and is one of the last two flying with the RAF from Brize Norton in Oxfordshire and being retired this week. Dunsfold Park will be open for visitors wishing to witness this important arrival, with access via the North Gate off Stovolds Hill. If you would like to witness the VC10’s final flight please email nancy.edwards@rutland.co.uk with your contact details. 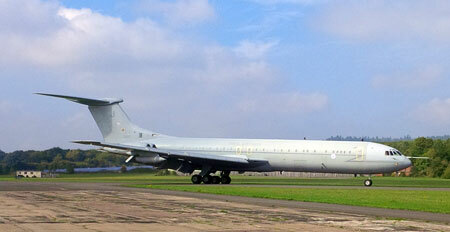 Longer-term arrangements for public access to the VC10 at Dunsfold Park will be confirmed in due course. Experience the virtual skies at the flight simulation event taking place at the Royal Air Force Museum Cosford, Shropshire on Saturday 19th October 2013. Just Flight and Flight 1, two leading flight simulation software publishers, will be hosting this major gathering in association with PC Pilot magazine to show visitors the very best in desktop flying. Visitors to the show will be able to fly the latest aircraft, check out the latest flight simulation hardware and chat with leading developers, publishers and other enthusiasts in addition to the many exhibitors at the show. Home to an impressive collection of aircraft and exhibitions, come along to Flight Sim 2013 at the RAF Museum Cosford this autumn and you’ll be able to experience the best of both the virtual world and the real world of aviation! Just Flight and Flight 1 guarantee a very warm welcome to all aviation enthusiasts, whether they are veteran desktop pilots, flight simulation novices, or anyone thinking of getting airborne in the virtual skies for the first time. Entrance to Flight Sim 2013 costs just £10 per person on the day, with free admittance for under 16s accompanied by an adult. For further information on the event visit the show’s website www.flightsimulatorshow.com. Work on the Auster AOP.9 in Display Hangar 1 at Newark Air Museum is progressing. The nose cowlings and panels have been de-corroded and primed and fitted to the main fuselage frames; as has the cockpit glazing. At the rear of the fuselage similar work has been completed on the fin. 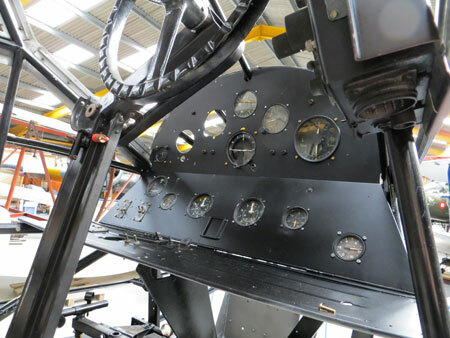 The internal restoration has also progressed, with the main instrument panels now refitted and installed. Work on the project is due to continue into the late autumn / winter months. The Auster AOP.9 was originally moved out of deep storage at the museum and into Display Hangar 1 on 31st January 2012. A survey of the fuselage framework was then undertaken with a view to allowing the long-term restoration of the airframe. A set of wings for the project remain in storage at the museum. The precise identity of the airframe has not been fully resolved. Examination of the manufactures plate on the aircraft gave a slightly confused picture about the military serials that it may have worn. The various suggested identities for the airframe still have not been fully resolved. XK381 or XS238 are believed to remain possibilities, while TA200 and XR238 have also been in the frame. Earlier in the summer Newark Air Museum was approached by Canberra cockpit owner Darren Green about the possibility of forming a restoration team to work on Canberra PR.7 WH791. This particular airframe is on loan to the museum, so the museum trustees put Darren in contact with Terry O’Halloran a member of the 31 Squadron Association. Several years ago Terry worked on behalf of the aircraft owner to co-ordinate work on the airframe, which was undertaken by members of 31 Squadron Association and cadets from 1237 (North Hykeham) Squadron, Air Training Corps (ATC). 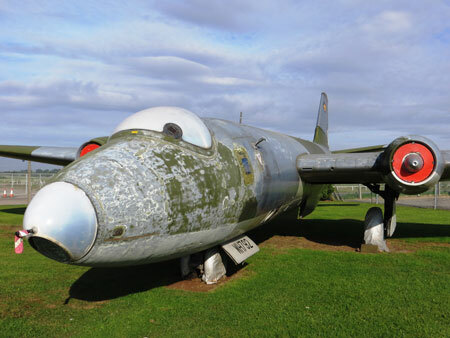 It has now been agreed that Darren Green and Terry O’Halloran will combine their resources and they are leading a group of Canberra enthusiasts who now plan to refurbish and repaint the airframe. The museum trustees have recently agreed to fund the cost of paint and materials for the project. As part of this agreement it is understood that the Canberra PR7 will retain its distinctive 31 Squadron markings, but it will revert to displaying its correct serial number of WH791. The recent spell of good weather has allowed some de-corrosion work and paint removal on the nose section of the fuselage to commence in preparation for the application of primer and paint. A detailed structural survey will be undertaken on the airframe in consultation with the museum’s Restoration Manager. Canberra PR.7 WH79, which arrived at Newark fifteen (15) years ago in autumn 1998, is one of six Canberra airframes and cockpit sections displayed at Newark Air Museum’s site on the former RAF Winthorpe airfield in eastern Nottinghamshire. There’s an array of amazing aerobatic spectaculars in store at The Duxford Air Show this weekend (Saturday 7 and Sunday 8 September)! 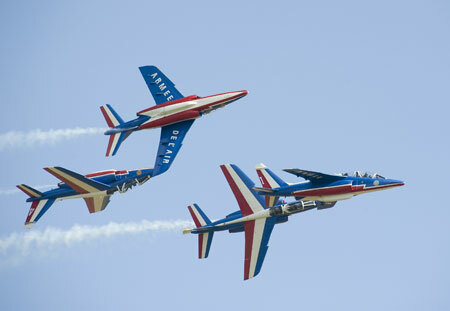 Opening Saturday’s flying display in gallic style is the Patrouille de France, the precision aerobatic display team of the French Air Force, who are one of the world’s most skilled demonstration teams. They’ll perform in the flying programme on Sunday, too. On Saturday, Pete Kynsey flies the Levier Cosmic Wind, the only aircraft of its type flying anywhere in the world. This aerobatic air racer is called Ballerina II and is as nimble in the air as its name suggests. There is no greater exponent of the Bucker Jungmann acrobatic aircraft than Anna Walker. Performing classic and competition-style aerobatics, including a challenging inverted low-level pass over the IWM Duxford airfield, Anna will be wowing the crowd on Saturday 7 September. Also flying on Saturday, and not to be confused with the famous aerobatic act which will be closing the weekend’s flying display, are The Red Sparrows, four de Havilland Chipmunk trainer aircraft which will be flying in close formation displays. Mark Jeffries controls the skies from all angles in his Extra 330SC aircraft. Mark is nine-time British aerobatic champion and his dizzy aerobatics will have a jaw-dropping effect on air show audiences on Saturday and Sunday. The Aerostars have been thrilling air show visitors with their tightly choreographed aerobatics, roaring radial engines and striking smoke effects for 17 years. They are a perennial favourite at IWM Duxford air shows and their imaginative displays will no doubt be a hit on the Saturday of The Duxford Air Show. Sunday’s flying programme concludes in grand style with The Red Arrows, the world-renowned and instantly-recognisable aerobatic team of the Royal Air Force. Alongside the eye-popping, head-swivelling aerobatic thrills and spills is a range of diverse and exciting flying displays. One of the highlights of Saturday’s flying display will be the arrival of the Boeing 747-8F, operated by Stansted Airport-based Global Supply Systems Limited and leased to British Airways World Cargo, in its debut UK air show appearance. On both Saturday and Sunday, the Battle of Britain Memorial Flight Avro Lancaster, Hawker Hurricane and Supermarine Spitfire pay tribute to the 70th anniversary of the Dambusters Raid. The historic jet-powered pairing of the North American F-86 Sabre and the CT-133 Shooting Star will contrast with the thunderous contemporary engines of the Eurofighter Typhoon, which can be seen later in the flying programme on Saturday and which opens the show in ferocious style on Sunday. The daredevil Piper Cub truck-top landing is an amazing feat of skill and precision that will entrance audiences on Saturday and Sunday. Sunday’s flying programme sees a demonstration of Royal Air Force capability with a search and rescue demonstration by the Westland Sea King operated by 22 Squadron at Wattisham Airfield and a display by the Shorts Tucano, operated by the Central Flying School at RAF Linton-on-Ouse. Visitors to The Duxford Air Show will also enjoy the piston-engined power of the Grumman Bearcat and Wildcat duo; the elegance of the B-17 Flying Fortress Sally B; the powerful B-25 Mitchell, two de Havilland Vampires and a range of Supermarine Spitfires in a classic Battle of Britain tail chase with a Hispano Buchon (Messerschmitt Bf 109). Entertainment continues across the museum throughout the day, with 1940s living history groups, children’s rides, the chance to clamber aboard Duxford Aviation Society’s retro airliners, fun history activities and the chance to explore the whole museum. You can also meet Colonel Richard Graham, who flew the SR-71 Blackbird which is now on display in the American Air Museum. Colonel Graham will be hosting fascinating walk-around tours of the SR-71 Blackbird in the American Air Museum at 10.30am and noon on both days of the air show. He will also be signing copies of his new book, SR-71: The Complete Illustrated History of the Blackbird. Join us for The Duxford Air Show, a fantastically fun flying weekend for all the family! Advance booking has now closed but you can pay on the gate as you join us this weekend.